Want to win a $5000 package to the English Poker Open in London this September? With only 3 remaining to be won at Cake Poker you need to move fast! Cake’s online qualifier schedule runs throughout August and into early September and offers a main event package every Sunday in its Weekly Finals. In addition, each winner will gain entry to the exclusive EPO Welcome Party aboard the HMS President ship on the River Thames in central London on 17 September. And an Official Team Cake gear pack. 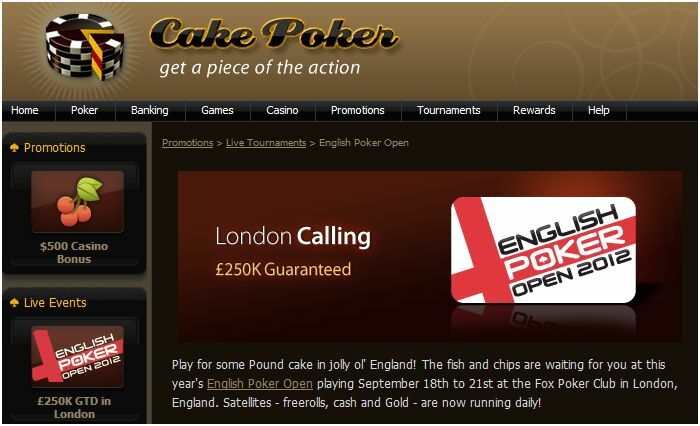 With just Sunday 19 August, Sunday 26 August and Sunday 2 September packages left to play for, check out the qualifiers at Cake Poker now! You can get yourself into the online qualifiers for as little as a $30 + $3 buy-in. RakeTheRake has also sponsored five freerolls daily at Cake which transport the top 3 finishers to a special 10 Seat Saturday feeder to Sunday’s Main Event Final! Details of all qualifying routes can be found at the English Poker Open.